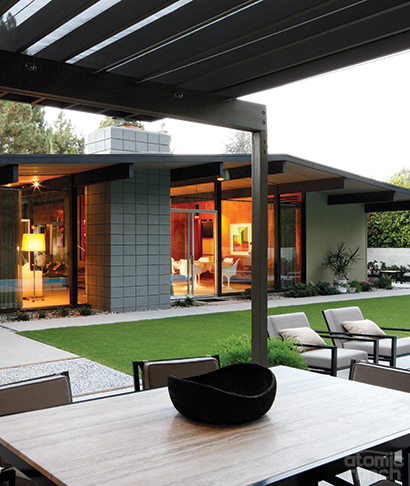 Harris had worked with designer Brad Dunning on the Kaufmann pool house and another Palm Springs property, and he felt Dunning had a unique understanding of the period and how to bring that forward to today. 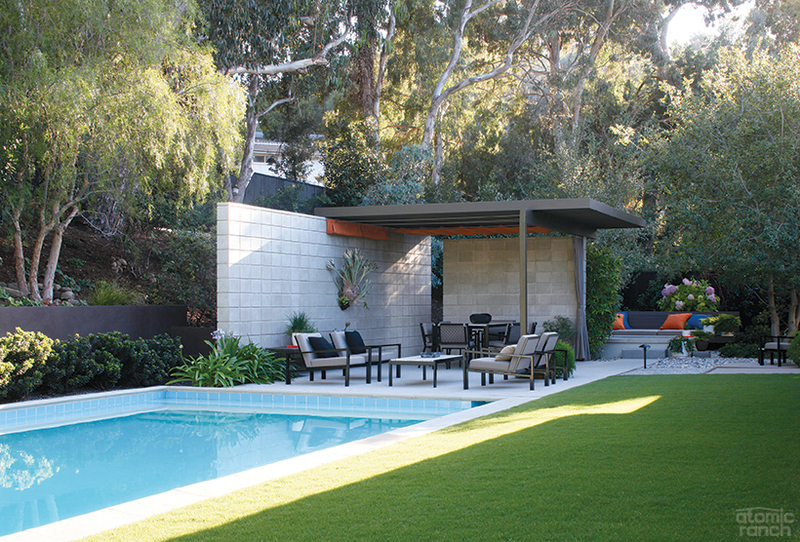 The two discussed adding on to the Eichler. Two reupholstered Florence Knoll armchairs and a Mies van der Rohe coffee table sit between a period Saarinen side table and a Sergio Rodrigues floor lamp. The ottoman is period as well, and the painting above the audio shelves is by Helen Lundeberg. The audiophile collection includes Klipsch Heresy speakers, an early-’60s two-stage tube amp tuner by Scott and a vintage ’60s Empire turntable, all of which run off glass-fuse wiring. The slab floors were finished with a decorative concrete coating, while the kitchen cabinets were repaired and refinished inside and out. Other details include new white laminate counters, a modest-size Frigidaire refrigerator, original ball lamps and a vintage wall phone to the right of the door to the walk-in pantry. The bar stools are vintage Paul Tuttles. Harris is happy to expand on that paneling issue: “I reopened a sandstone quarry from the 1945 period to finish a piece of the Kaufmann [House] where the stone had been thrown away,” he recounts, adding that he also rejected said stone initially, but that’s another story. “In this case, I had to find luan mahogany of a mid grade. Today you can get low-grade mahogany that they use as shipping containers that has lots of knots—unacceptable. The higher grade is all perfect and bookmatched, all Arch Digest, and that’s wrong, so you have to find mid grade. Even then, you want to select the pieces. 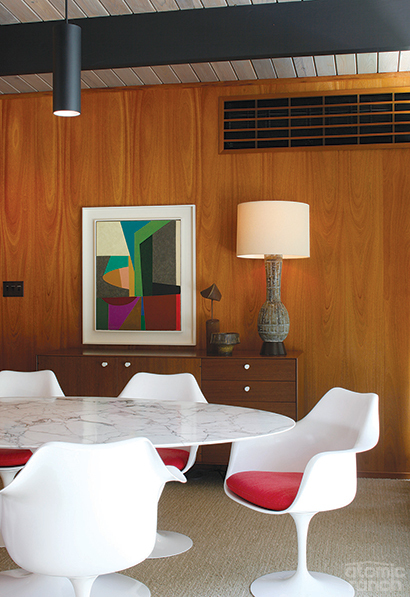 A bespoke pendant by Brad Dunning hangs over the vintage Saarinen Tulip table and chairs. A George Nelson ‘Thin Edge’ credenza holds ‘Intro’ by Frederick Hammersley and other pieces that date from around the 1964 built date of the house. 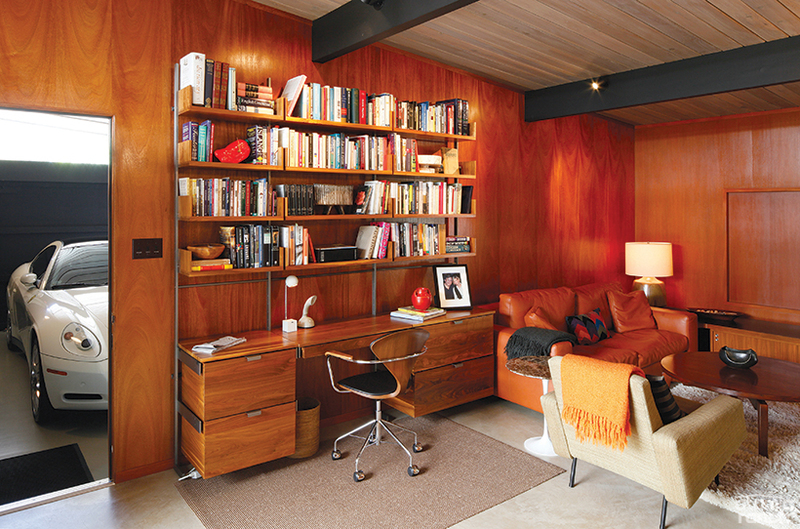 In Eichler’s ‘multipurpose’ room, the luan paneled walls house a built-in flat-screen, with custom media storage below and an Atlas Industries wall unit. The desk chair is a Cherner, and a Poltrona Frau sofa and Pierre Guariche armchair surround a coffee table by Jens Risom; the corner table lamp is by David Cressey. On the floor are a rya-style area rug and an abaca woven mat; in the garage is their Ferrari 612 Scaglietti. The renovation took five years, three of them involving heavy construction or extensive woodworking to restore or recreate damaged beams, exterior siding, cabinetry, paneling and millwork. 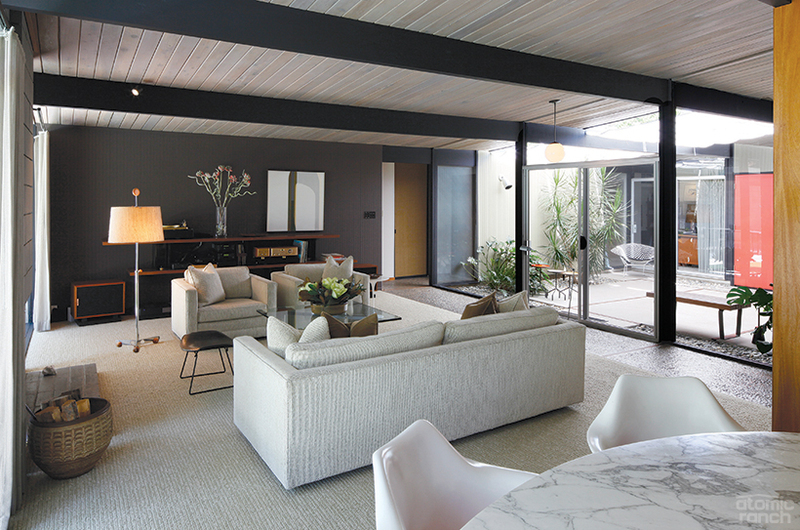 Matching the original blue-gray color wash on the ceilings, selecting a paint palette, making 1964 fixtures and finishes functional again, and landscaping all took thousands of hours. 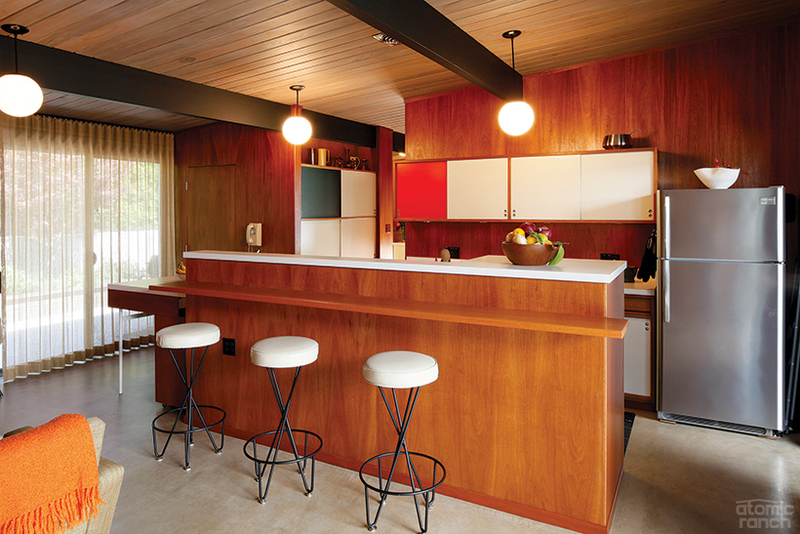 The renovation took five years, three of them involving heavy construction or extensive woodworking to restore or recreate damaged beams, exterior siding, cabinetry, paneling and millwork. “I’m not sure [Eichlers] were easy to live in at the time,” Meulbroek comments. “The architects gave these houses a great look, but even for the day, I think the closets were probably small and probably had to be with so much glass and not that much wall space. They maximized the look, not the practicality. While the radiant heat system just needed minor repairs, the absence of air conditioning was original but unacceptable. To avoid unsightly AC ducts on the roof, several split system units were installed with custom interior grills inset into the walls. 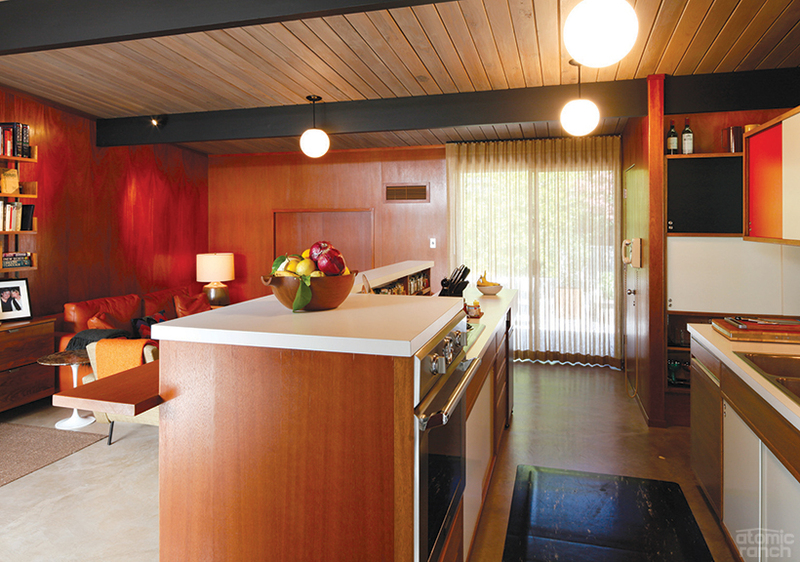 Furnishings, artwork and accessories include midcentury and vintage pieces from Harris’ previous condo, items purchased expressly for this house under Dunning’s tutelage, and lots of books courtesy of Professor Meulbroek. Asked to compare his two highly personal homes, Harris had this to say. “They’re both outstanding designs— both from the perspective of how history has judged them and as an occupant—and extremely dynamic in their looks. For modern structures, it’s a fine line, because they can be uncomfortable and cold, and that is simply not the case in either one of them. “Kaufmann, while not a large house, is a bigger house, particularly for 1946, and a much bigger property—close to 2.5 acres,” he continues. “Kaufmann is a pretty spectacular masterpiece. But this [Eichler] is tremendous for what it was; I don’t know of a tract that is even close to this inspiration and realization. Fairhills was seen as a neighborhood with great design, while Kaufmann was conceived on a very high budget for an extremely important client.